Today, I would be coming back from my 3 week break with a new tutorial about how you could set up settings for your application. In this tutorial we would be building a complete application from scratch. Almost all applications give users options to change some parts of the application either embedded in the template or even part of the logic of the application. 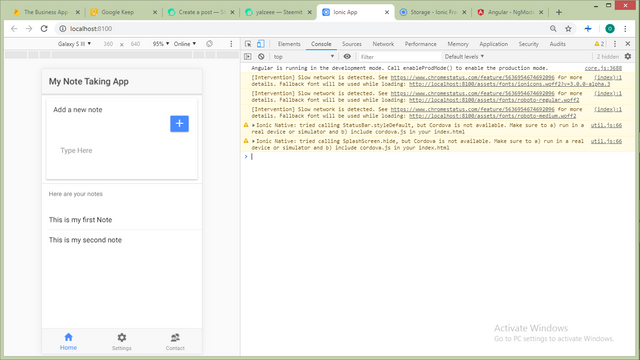 I did some research and this isn't properly taught on any free courses so i chose to show my reader how you could set up settings for your application using lifecycle events and storage memory for a local app. And you could also use your backend to sync settings for a user that may be using his account over multiple devices. Agree to all the prompts and then proceed to open your preferred editor in the folder that ionic just created. Lifecycle events are functions that are triggered automatically when a user is switching between views. -ionViewDidLoad: Triggered the first time the view loads. For the purpose of this tutorial we would have to create some logic which we would like the user to be allowed to change. We would be making the user choose what content he would see on his homepage from the settings page. Our app comes with the Home, About and Contact Tab. For this tutorial, we would be converting the About Tab to the settings tab. Head over to the tabs.html document under the tabs folder and make this relevant changes. You can now head to your home page and begin creating the template for a simple note taking app. This would be the content of the homepage. 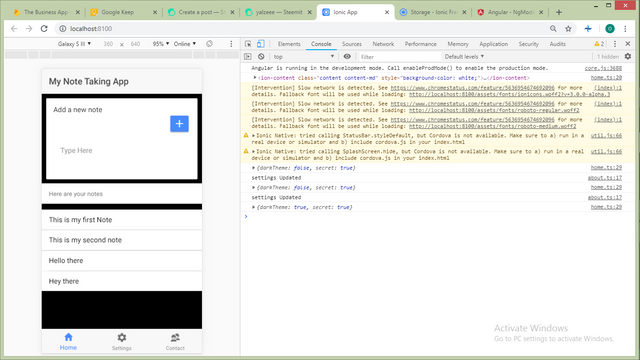 And you can then run ionic s which would run in our browser to show the template. As we can see for this tutorial we would be using a simple note taking application. Note: To get the storage to work you would need to update your app.module.ts file to know which storage to use like this. After that head to your home.ts file and add the logic that helps you collect these notes and store them on the devices storage. And with this we can get to adding settings. For the purpose of this tutorial we would be using settings to change the theme of the application and restrict who can add notes to this app by requiring a secret key. Head to your setting tab and add a toggle for the light and dark theme and another for the restriction to a secret key. In ionic there is an event triggered whenever a toggle is changed and this is the (ionChange). So we would imply bind that event to any change in the toggles to update them in the home page template. So the last step to this would be to update the template based on the setting whenever the page loads using the life cycle events. So what is happening here is that the view is being updated every time the user enters that view by checking the settings and using the data to updated what the user sees in the view. At the end we see that our settings are working when we change view. You can find the code for this tutorial in my GITHUB repository. Concepts shared in here do sound useful for anyone building ionic apps. 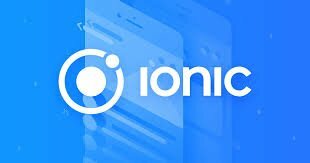 It would be helpful to your readers to point other related prior tutorials you had made on ionic, indicating that this is part of a series. A gif would have been more useful in showing the results of adjusting the settings, or a before/after screenshot. Thank you for your review, @mcfarhat! Keep up the good work!